Highlights of what YOU made possible in 2015! America magazine published Serrin’s landmark speech, “The Feminist Case Against Abortion” as the cover story the week leading up to Roe v. Wade, and the editors interviewed her on “America This Week” on SiriusXM. Leading up to the March for Life, Serrin was interviewed by New Hampshire Talk Radio and an ABC affiliate AM station as well as SiriusXM’s The Catholic Channel. Images of FFL’s placards were prominent in local media including the Chicago Sun Times video and other events in LA and San Francisco. FFL’s Annual Capitol Hill Intern Briefing was our biggest ever and was covered by EWTN News Nightly. 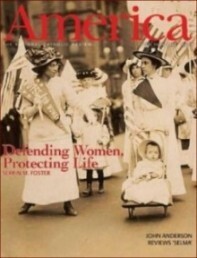 The most comprehensive documentation yet of our pro-life feminist foremothers’ quotes in The American Feminist titled “First Wave Feminists: Remarkable Pro-Life Women ® and Other Suffragists You Should Know,” was distributed on the Hill, to students across the country, and for the first time ever—to professors who teach women’s history! 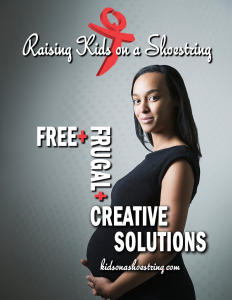 FFL launched a dynamic new website, Raising Kids on a Shoestring, filled with even more free, frugal and creative solutions—and a brand new ad for you to help us share the resources. 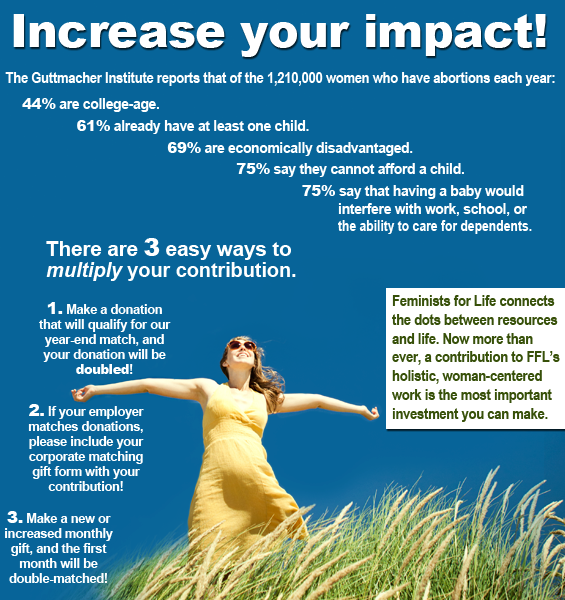 In January, FFL was once again at Students for Life of America conferences in Maryland and California and at the Cardinal O’Connor Conference on Life at Georgetown University. Spring events included the first Pregnancy Resource Forum at George Mason University moderated by Serrin. 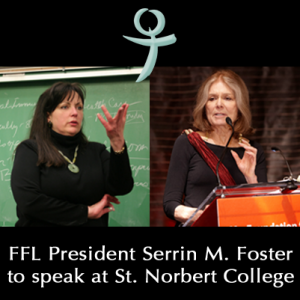 She also presented “The Feminist Case AgainstAbortion” at Loyola-Chicago, Fairfield University, CT, and at St. Norbert’s College, WI—after Gloria Steinem’s presentation there resulted in a nationwide petition and surrounding press to bring Serrin to campus. Serrin also participated in a panel discussion at the University of Mary Washington. Sally Winn presented “Refuse to Choose: Reclaiming Feminism” at Gonzaga University. FFL fall lectures included Serrin addressing an audience of 300 at the University of Tennessee at Knoxville in September, 200 at Canisius College in Buffalo, NY, and Wingate University, NC, while Sally Winn spoke at North Dakota State University. And for the first time, the Sisters of Mercy hosted a lecture on their campus in Belmont, NC, inviting students from Belmont Abbey College and others from the community. Serrin moderated the 20th Annual Pregnancy Resource Forum at Georgetown University which was covered by EWTN. At the invitation of March for Life President Jeanne Mancini, Serrin was invited to a Capitol Hill briefing in November to announce the new theme of the March for Life 2016: Pro-Life and Pro-Woman Go Hand in Hand. The event was covered by The Washington Times, LifeSiteNews.com, CBN and EWTN. That same day, Newsmax named Serrin and FFL Speakers Joyce McCauley-Benner and Chaunie Brusie in the top 100 most influential pro-life advocates(numbers, 34, 38, and 39 respectively). 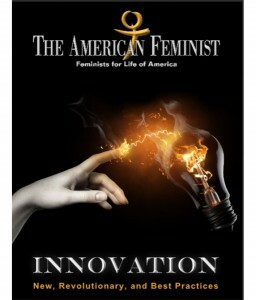 The American Feminist entitled “Innovation” covers new, revolutionary and best practices in the pro-woman, pro-life movement. The winter edition serves as a primer to those new to our movement and will inspire everyone to reach for better solutions that will go viral! Thank you! Please help us end this year strong so that we can do more and better for the most vulnerable in 2015. The year end match is on! Choose which is best for you or refuse to choose! Either way, please, give now.